Nintendo GBA Game published 17 years ago by BAM! Ent. 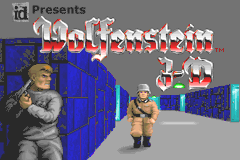 Wolfenstein 3D © 2002 BAM! Ent. A Nazi stronghold awaits, and only you can smash your way into its hidden depths, blowing away enemy scum as you go. Ammo up - this is the game the Computer Gaming World Hall of Fame credits as helping shape the computer gaming industry! Id Software's classic powerhouse is back - and now in the palm of your hand! Let the carnage begin. Armed with serious firepower you blast deep into the enemy's stronghold. Classic gameplay, classic characters, classic action - the original FPS hit. Nazis engage you at every turn, defending the castle's ruthless secrets. Released on April 02, 2002 in USA.